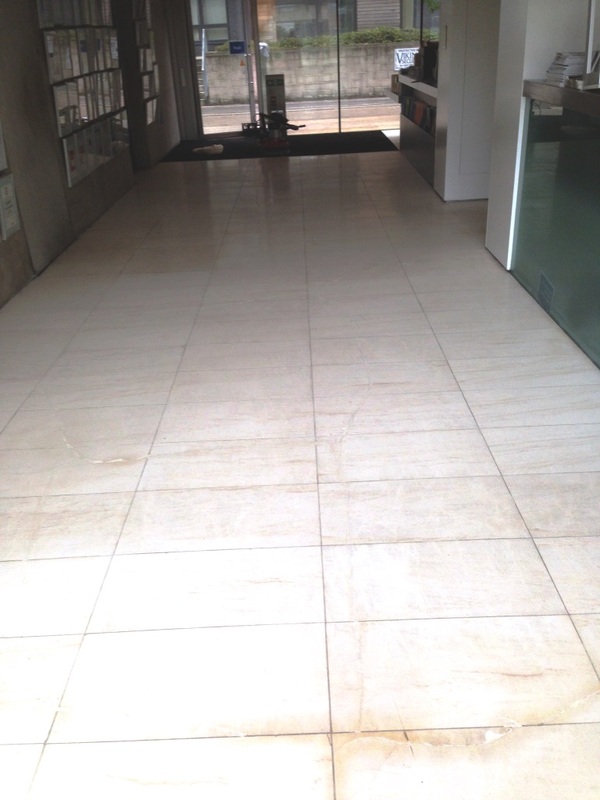 This is a polished Limestone floor in the reception area of an office in the town of Wilmslow that had been installed around ten years prior. 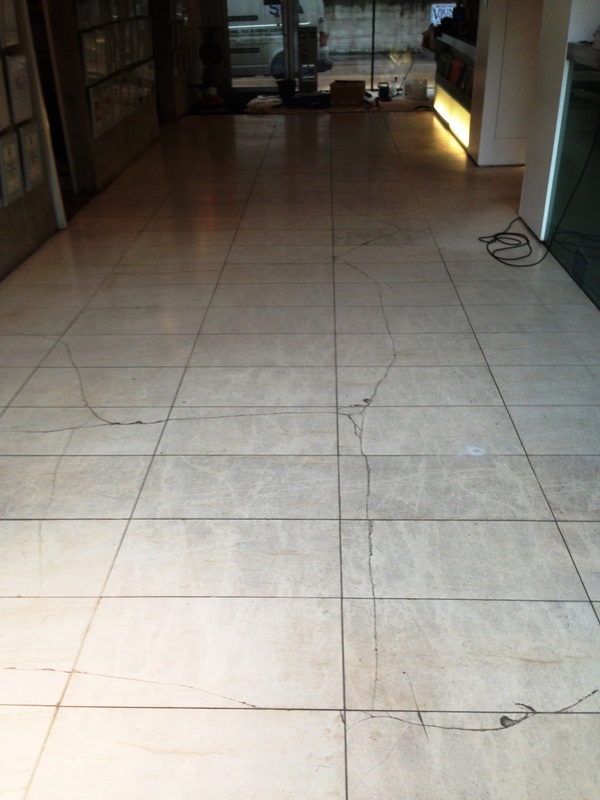 As you can see they were now in a poor state with ingrained dirt and cracks across the surface of some of the tiles. The polished Limestone tiles needed to be cut back and refinished with a set of diamond encrusted burnishing pads however my first task was to clean the grout lines by applying a medium dilution of Tile Doctor Pro-Clean and scrubbing it in with a stiff narrow brush. I gave the grout a rinse with hot water and removed the now soiled water with a wet vacuum. The next task was to start the burnishing process by running a course pad fitter to my rotary machine over each tile lubricated with a little water. The coarse pad removes the dirt from the Limestone and resultant slurry is washed away with more water and the wet vacuum. This process is repeated with the “medium” and “fine” polishing pads which restore the surface and build up the polish back on the tile. Before moving onto the final polishing pad I tackled the large cracks in the tile by filling them with a colour matching resin. There could be a number of reasons for the cracks but typically it would indicate some sort of movement in the subfloor. A common cause is due to the concrete base was not being given sufficient time to dry out before being tiled over and shrinkage in the concrete as it dries caused movement. Once the resin had dried I moved onto to apply the final “Super Fine” polishing pad which brings up the polish on the Limestone to that final deep level again using a little water and rinsing down afterwards. Once the floor was dry it was then sealed with two coats of Tile Doctor Colour Grow which is an impregnating sealer which penetrates into the pores of the stone protecting it from within, it also had the added benefit of bringing out the natural colours in the stone enhancing the look of the floor. This entry was posted in Limestone Posts and tagged cleaning, commercial cleaning, limestone floor, north cheshire, office floor, polishing, reception area, sealing, tile repair, Wilmslow by AbzDominise. Bookmark the permalink. Another reason for cracks in the tiles can be heated floors where the heating pipes are buried in the floor and the heat is turned up too quickly before the floor has had chance to dry out naturally. This causes movement in the base and if tiles have been laid they will also move.